I saw four elk cows on my morning hike a couple of days ago. It was so good to see them again finally! 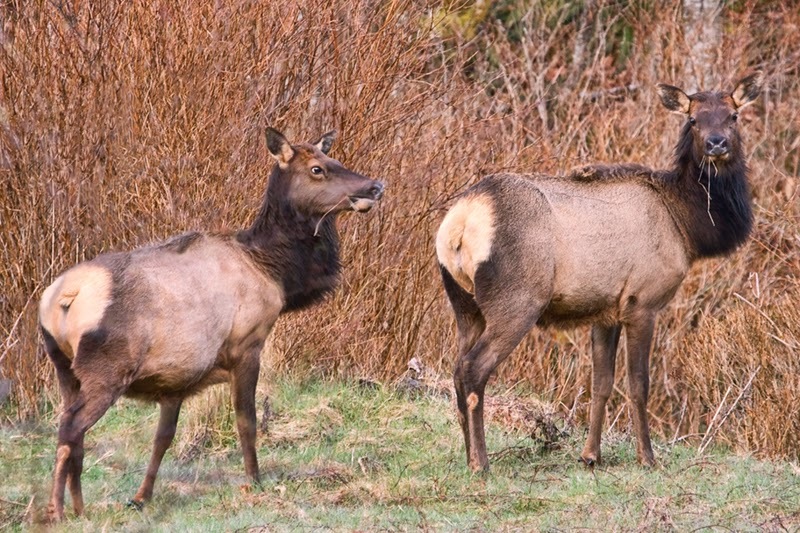 Two dozen elk were trapped and relocated to another area of British Columbia earlier this month. I talked to the biologist who was involved with baiting and trapping the elk, and he told me they were trying to keep the herd here on the coast to 200 because they become "a problem" otherwise. I hadn't seen hide nor hair of the elk since the two dozen were relocated. Actually, I haven't seen nearly as many elk overall in the past year as I used to see. They're like old friends that I like to stay in touch with. Anyway, when I spotted them as I came out of the wood, we stood and stared at each other for awhile and I took some pictures (not the one above), and then they calmly walked into the forest. I hope they stay in touch.